Activision updates its already addictive shooter. There goes the afternoon. Earlier this year, we went bonkers for Skylanders Cloud Patrol, Activision's arcade style shooter that pits players against endless waves of trolls. It consumed so much time that we had to put it down and quit cold turkey. So much for that, but in this case, a relapse doesn't seem that bad. Turns out, the publisher just released an update that should improve Cloud Patrol, and we look forward to giving these new features a go. -Rewards for players who advance past Level 50. Players will earn a new badge and will be able to progress past level 50. They'll also get new and more challenging goals. -Additional magic item slot option. -Increasing score multiplier for each hideout cleared. 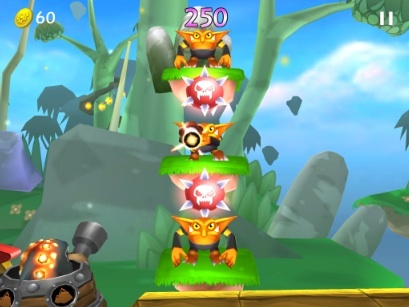 -Rocket Booster allows players to spend some coins at the beginning of a run and skip early levels. Read Modojo's Skylanders Cloud Patrol review.